In 1932, a dilapidated barn in rural Becket MA, just east of Lee MA, served as the birthplace of a major American dance festival. Bought by Ted Shawn and renovated for performances, the barn and the festival grew larger and more important over the years, enlisting the talents of Alvin Ailey, Merce Cunningham, and similar lights. The 10-week Jacob's Pillow Dance Festival season begins in late June and runs through August, with many perforances now held in the modern Ted Shawn Theater. The Jacob's Pillow Dance Festival performance center is in the countryside 8 miles (13 km) east of Lee, off US 20 (map). Follow the signs. 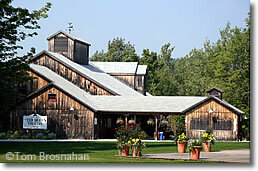 The Ted Shawn Theater at Jacob's Pillow Dance Festival, Becket MA—true to its barn heritage.